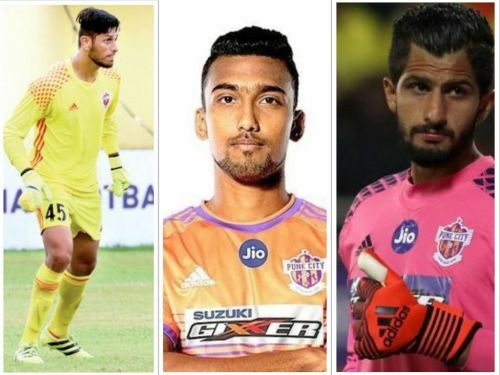 Indian Super League club Kerala Blasters could sign Vishal Kaith from FC Pune City and Bilal Khan from Real Kashmir to bolster their squad ahead of the next season, according to sources. Sarthak Golui, who has been with the Pune franchise, may move to neighbouring club Mumbai City. Kerala Blasters witnessed a disappointing season this time. The two-time finalists finished in ninth position with 15 points from 18 matches, winning two and losing seven matches in the process. U-17 World Cupper Dheeraj Singh has been one of the standout players who played for Kerala this season. The Manipuri pulled off some excellent saves in various matches to keep the scoreline respectable. But as it seems, Kerala are looking to inject more blood in their team. The one who caught their eye is Vishal Kaith. The goalkeeper may have conceded 10 goals in the four matches he played, but he pulled off some scintillating saves in the process. He made 14 saves and faced 24 goal-bound shots. He was later replaced by Kamaljit Singh under the bar. Bilal Khan, who was signed by Pune City, was loaned out to Real Kashmir before the start of the season and definitely, he is the best goalkeeper of the tournament. He has managed to keep 10 clean sheets in 19 matches that he played. It is because of Bilal that Real Kashmir conceded least number of goals (14) among all the teams. With a height of 6’5”, Bilal is one among the tallest footballers of the country. It is his height which made him play the game. On the other hand, Kaith is only 22 years old and a product of the Shillong Lajong Football Academy. Golui featured in 12 matches for his side this season and played a vital part in the later part of their campaign. He forced 26 tackles and made 18 interceptions along with 89 clearances. Apart from that, he also made two assists. After signing for Pune from Mohun Bagan, the defender may make another switch next season.